Swirrl Blog | What is Linked Data? I suspect many of our readers may already have a black belt in Linked Data, but for others it’s all new, so I thought it was worth explaining what Linked Data means to me. The definitive description is Tim Berners-Lee’s Design Issues document, but I’ll try to illustrate what this means in practice. Linked Data can be used to describe any real-world things, such as people, objects, events, observations etc. Let’s say we want to describe a unicorn (called Yuri). 2. As you’d expect from a web address, people can look it up. Dereferencable (look-up-able) identifiers are a key feature of Linked Data. Looking up this URI would yield useful information about Yuri the Unicorn, such as his height, weight, eye colour, and horn-length. 3. The info also contains links that connect Yuri to related things (such as Yuri’s family members, owner, breed etc. ), and be available in different useful formats. This puts Yuri in context, and allows the person originally interested in Yuri to continue browsing and discover other useful stuff. If you click on the link above, you will be redirected (via a 303 “see other” response) to an HTML page which contains information about the City of Manchester. Aside: It’s worth noting that your browser ends up at a different address to the original URI you entered. 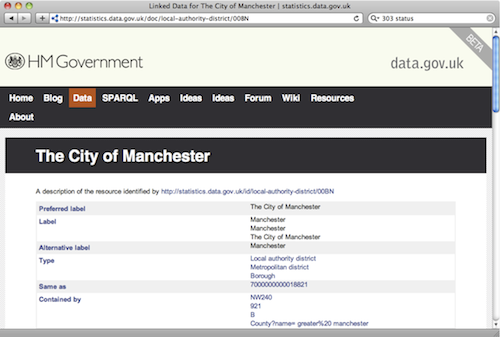 This is because in Linked Data we make a distinction between the real world thing, the City of Manchester local authority (…/id/…) and a document about the City of Manchester (…/doc/…). It can seem like nit-picking, but I think it’s an important point to get your head around. On that web page, there are links to other related things, such as the containing county, Greater Manchester. You can request the information about the City of Manchester in different formats by including an HTTP accept header. I’ve used JSON in my example as many developers are already familiar with that, but you can get the same information in other formats including RDF/XML (.rdf) and Turtle (.ttl).